There is nothing quite like summer in Milwaukee! I always look forward to exploring all the outdoor summer fun the city offers and I cherish the early evenings talking with neighbors while all the kids run around and play. The event last Thursday was the best of both worlds. It provided my boys with a lot of fun activities, while simultaneously allowing us to meet some neighbors who are newer to not only the Milwaukee area, but also to the United States. 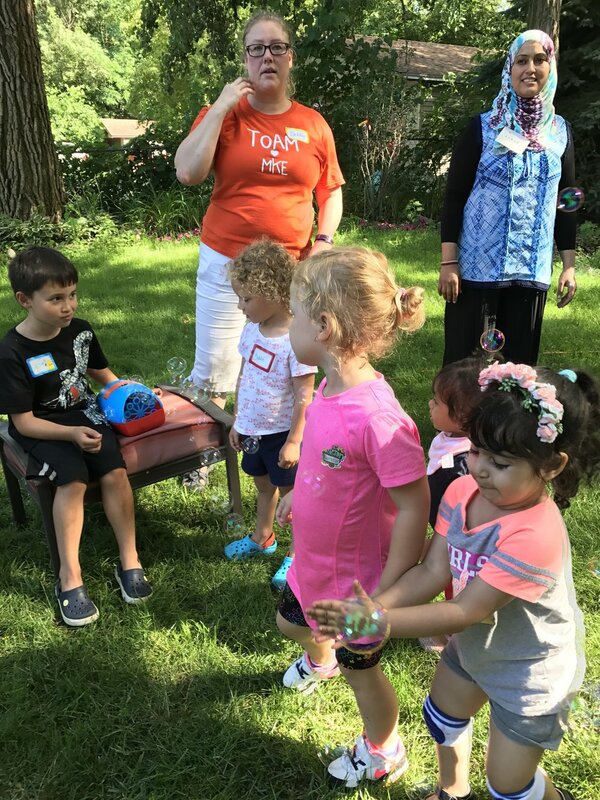 For this event, Toddlers and Kids on a Mission families and refugee-status families participated in a Toddler Camp that ran simultaneously to a school aged camp run by Leslie Osborne. The Toddler Camp was a way for us to welcome our new neighbors to Milwaukee, in a loving and kid-friendly environment. The day began with families being greeted with playdoh, coloring pages, and chalk to pass the time before camp started. Then kids were able to get a snack as they settled into a story featuring woodland creatures that demonstrated what it is to be a good friend and neighbor. This was followed by a craft which involved making an owl paper bag puppet. We ended the camp with some active fun which included bubbles, dancing, singing, and parachute games. For the families that could stay a little longer, we were then showered with love from our new friends in the form of food. They were so excited to share their native dishes with us, and the food was absolutely delicious! It was an amazing day, and I loved seeing families from different backgrounds having fun, laughing, and talking with each other. There were smiles on everyone’s faces, and I think that is a universal sign of a successful day! This event was just the beginning of what Toddlers and Kids on a Mission hopes to be a lasting friendship with our new neighbors. Look for upcoming events that will take place this fall!